I realise with shock and horror that it has been ages since I wrote on my blog. However, I have not been idle. The house renovation is nearly done and I have designed a whole new collection. Suddenly everything seems to be lifting since my dad’s death. I feel less weighed down and a lot more energetic. Full steam ahead with developing products for 2016 and applying to shows. I am really looking forward to it. The new collection is inspired by my love for woodland gardens. As a child I often played in the woods, climbed trees, explored secret and shady corners. There is something truly magical and secretive about a woodland garden. One of my favourite places is the Colby Woodland Gardens outside Tenby in Wales. www.nationaltrust.org.uk/colby-woodland-garden/ where I have spent many happy hours sketching. Last year I saw a stunning exhibition of Odilion Redon at the Fondation Beyeler in Basel. www.fondationbeyeler.ch/en/content/odilon-redon His floating dreamlike images and unusual colours also influenced this collection. 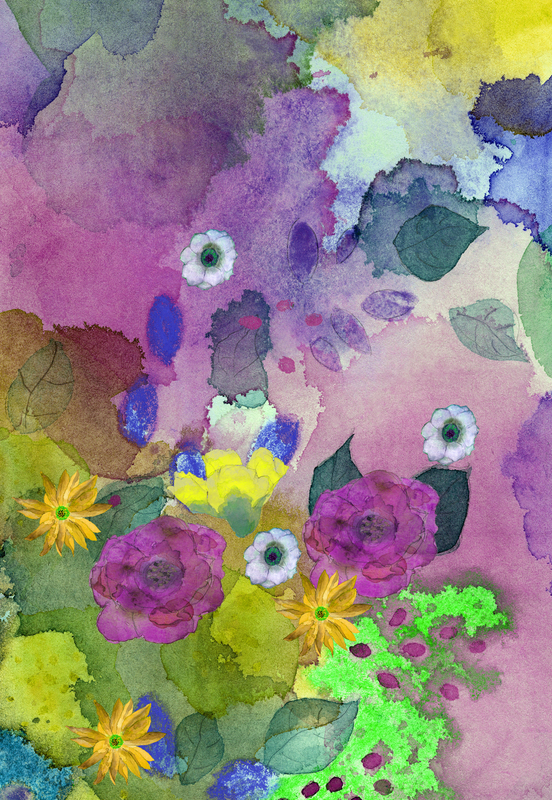 Here is a small taste of one of my designs called “Woodland Bouquet”. It is so inspiring and refreshing to work with new designs. This would make an eyecatching wall hanging or curtains.